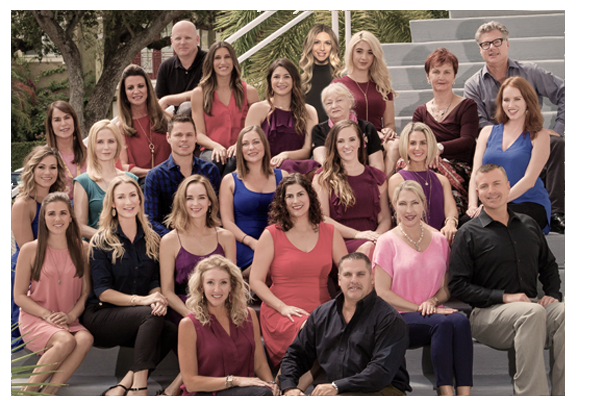 Faces of South Tampa truly brings it all together by reinventing the patient-practitioner relationship, offering clients a level of personal attention that is second-to-none. With a great location, a solid team of professionals, and the best aesthetic products and service available from BOTOX® Cosmetic and JUVÉDERM®, to CoolSculpting®, LATISSE® and top-of-the-line, prescription-grade peels and facials, Faces of South Tampa provides its discerning clients with the best in the business. It was 2009 when Jennifer Puleo, ARNP, MPH and her husband Mike Puleo decided to revolutionize the modern medical aesthetics concept and open the area’s most trusted name in aesthetics and skincare. By combining Jen’s medical aesthetic expertise and Mike’s business acumen, the duo were able to transform the waterfront location on Bayshore into an upscale facility that fused New York’s urban energy with South Tampa’s historic, small-town charm. In the Carriage House where Faces premiered, Faces staff provides its discerning clients with top-of-the-line facials, prescription-grade peels, and the best skin-care products in the business; and patients may also choose from many other aesthetic services such as CoolSculpting®, HydraFacialMD®, and Microneedling offered in one of three treatment rooms. In 2012, Faces expanded into the 3-story Bigelow Mansion, where a grand entrance leads to a stunningly-restored facility that is equal parts elegant and relaxing. Inside the mansion, you’ll find an additional seven expansive treatment rooms where Faces staff offer even more of the best aesthetic products and technologies in the marketplace, including BOTOX® Cosmetic, JUVÉDERM®, Voluma®, Sculptra® Aesethetic, and TruPRP®, in addition to Dermaplaning, Micro-current Remodeling Facials, and Lash Extensions. An entire floor is dedicated to laser procedures such as Cynosure IPL, Fractional, and Laser Hair Removal; PicoSure® Tattoo Removal; and Ultherapy®. Stand-alone makeup application stations and spacious retail skincare centers are available on multiple floors where patients can leisurely browse top-of-the-line medical-grade skincare products or be color-matched using the extensive mineral makeup product lines. You are sure to feel right at home within the Bigelow Mansion and Carriage House, where any prior expectations of an aesthetics center are completely transformed. With such a great location and a team of experts in place, Faces truly brings it all together by reinventing the patient-practitioner relationship, offering clients a level of personal attention that the industry had yet to experience. “When we started, we had the vision of what Faces of South Tampa would be and everything centered on a model of impeccable customer service combined with undeniable, superior results,”- Mike says. Even though Faces of South Tampa has grown far quicker than Mike and Jennifer ever anticipated, it’s obvious that every step forward has been perfectly timed and calculated. And the things they have in store for the future are sure to excite past, present and future clients alike.